Hello everyone! 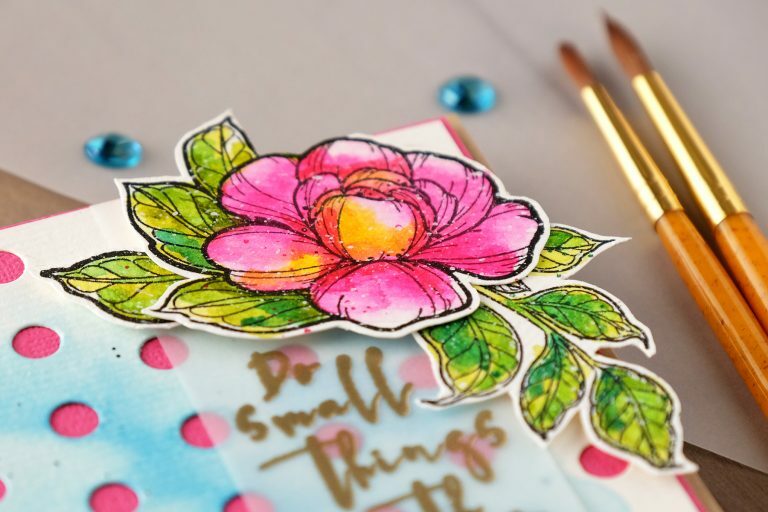 My name is Wanda Guess and I’m very happy to be sharing a project here on the Spellbinders Blog today! Hope you are having a wonderful day! 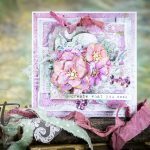 I am an avid paper crafter and blogger and I love to share art with people. I try to do something creative every day. I hope you’ll visit my blog – A Blog Called Wanda. If I’m not blogging, you will most likely find me sharing photos on Instagram. My Instagram is @stampcatwg. 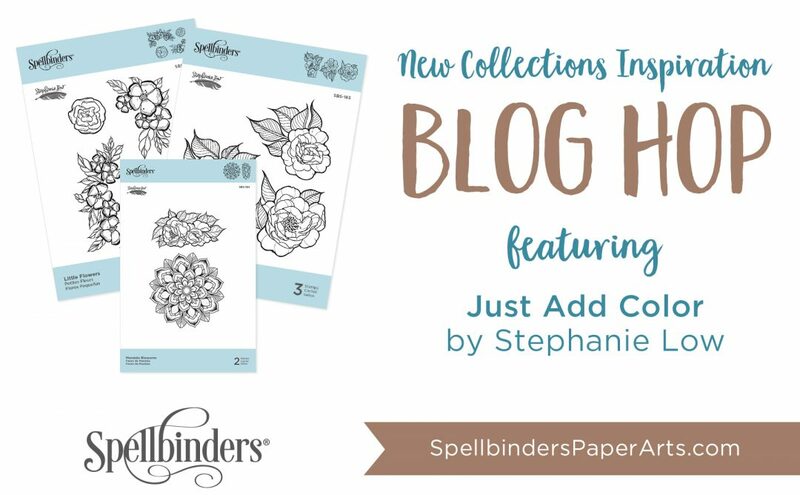 For today’s project I am featuring the gorgeous new collection from Spellbinders Artist Stephanie Low. 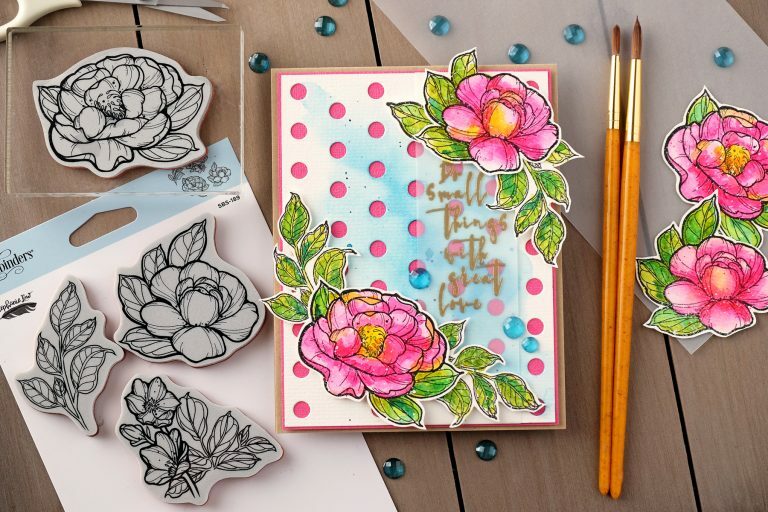 The collection is called Just Add Color and it’s blooming full of gorgeous flowers, feathers and mandalas. It was hard to choose which stamp set to use because they are all so very pretty. These images are perfect for coloring – with the medium of your choice. Markers, Paints, Pencils…the creativity is endless! I chose to use bright and vivid watercolors for my card. Let’s get started! 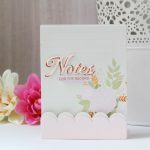 The focus of my card is these big pink blooms! They are from the stamp set called Large Peonies. My finished card is an A2 size. I started with a Kraft card base. 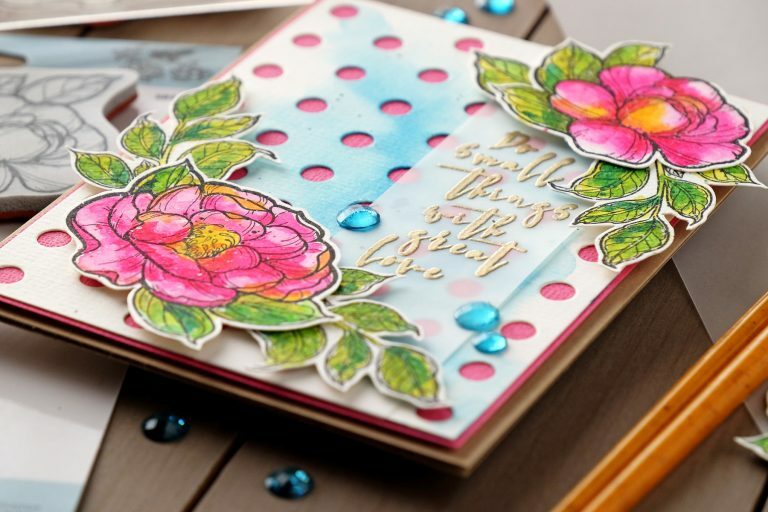 I layered pretty hot pink paper to show through the Lots of Dots Die Cut and then layered the flowers on top. The sentiment is from the Small Things stamp set and I heat embossed it in gold on vellum for a feminine touch. Here are some step by step photos of my process. I stamped the flowers and leaves onto watercolor paper with rich black ink. I used my favorite watercolor palette to paint the images. I used a heat tool to dry them and then splattered pink paint and white ink over the top. Then I dried them again with the heat tool. The gorgeous Lots of Dots background die was also cut out of watercolor paper. I added a sheer wash of light blue watercolor paint over it. I love this pretty sentiment and I wanted a sheer look to it so as to not distract from all the color. I used gold embossing powder and embossed onto a strip of vellum. 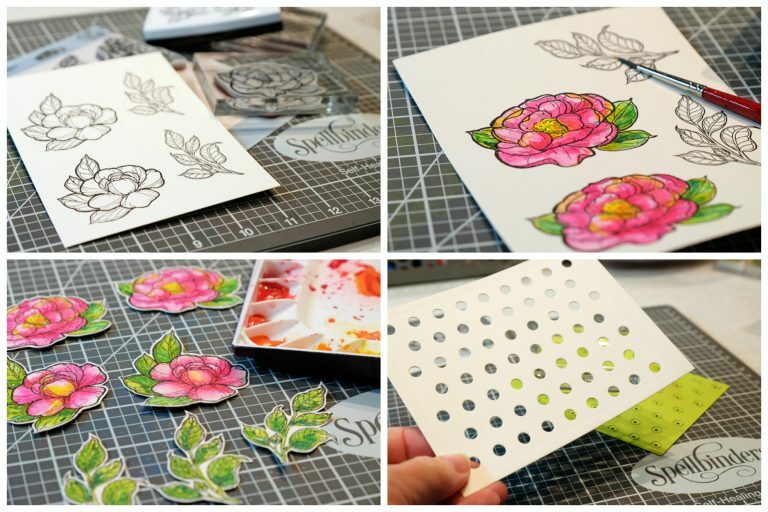 Tip: Vellum paper melts! 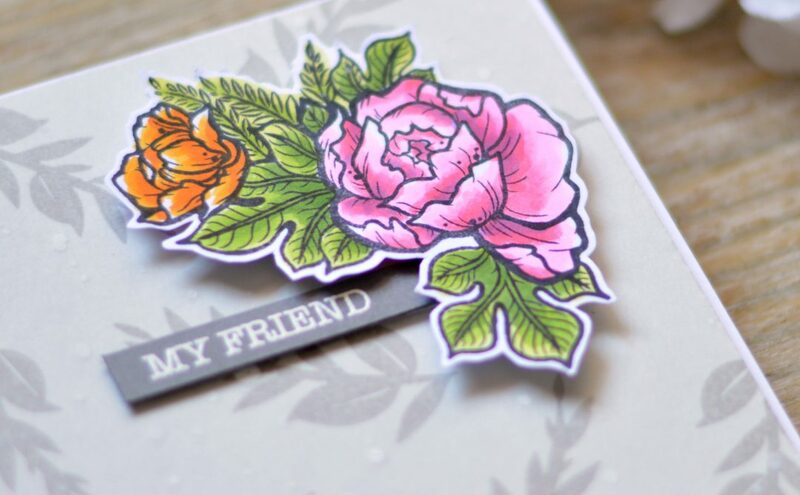 When you heat emboss on vellum use quick bursts of the heat tool to melt the embossing powder! I wrapped the vellum strip around the dots layer before I attached that layer to my card. I always use a lot of foam tape on my card because I love dimension! I attached the flowers and leaves with foam tape to frame the sentiment. 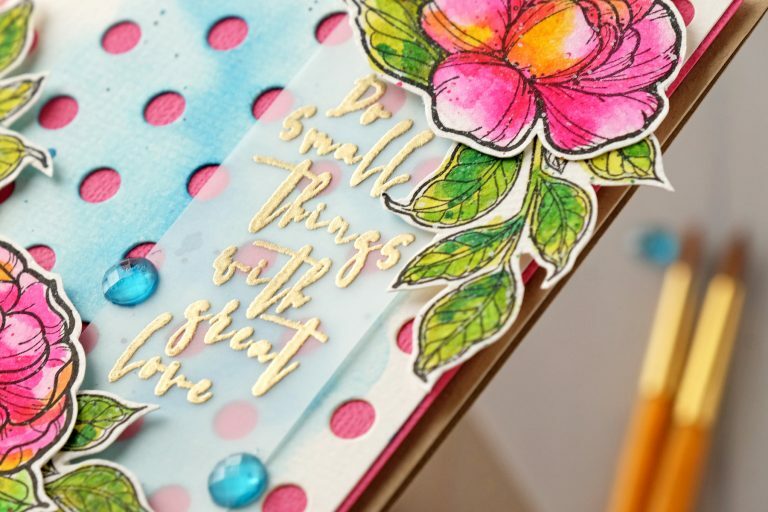 As a finishing touch I used one of my very very favorite supplies from Fun Stampers Journey – The Rainbow Drops! I used a few of the blue dots to add just a bit of sparkle. Arteza Watercolor Paper, Mijello Mission Watercolors, Gold Embossing Powder, Versafine Onyx Black Ink, Versamark Ink. 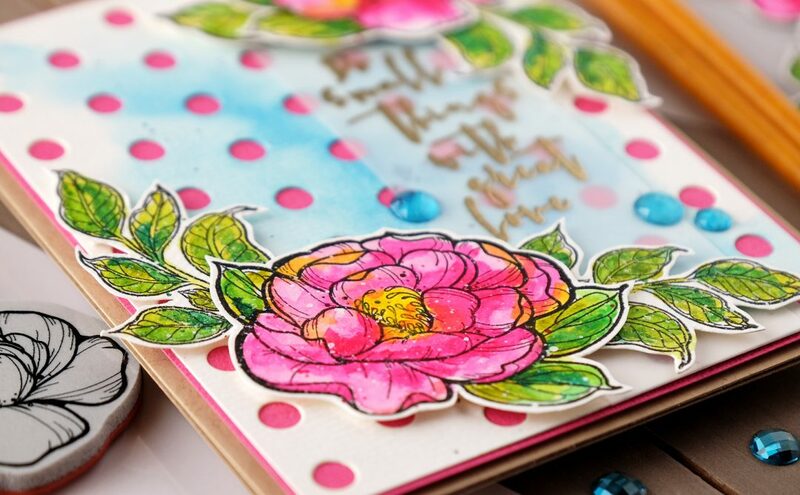 Big thank you to the team at Spellbinders for inviting me to be a guest designer today! 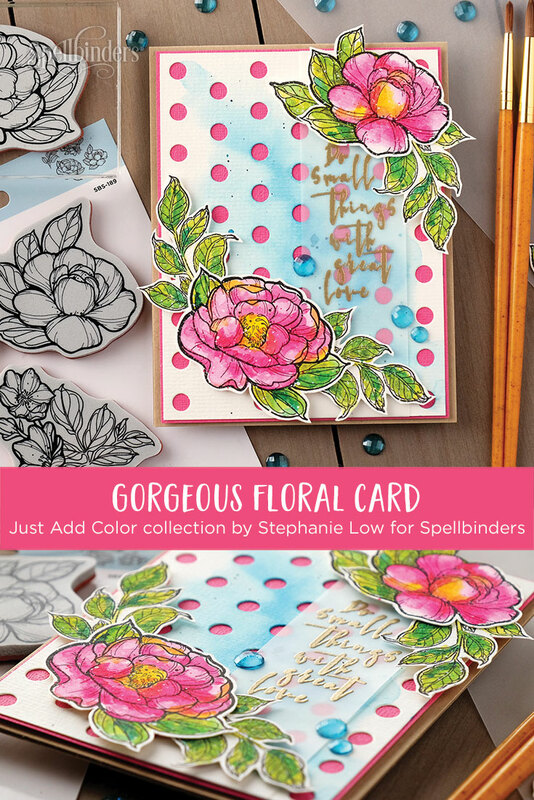 I had fun working with the beautiful Just Add Color Collection from Stephanie Low. I hope I’ve inspired you to create something today. That stamp set is awesome and the stencil and sentiment are just amazing. Thank you so much for showing great inspiration using this new products. Wanda, this is outstanding! 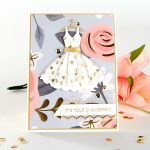 Congratulations and thank you for sharing through Spellbinders. 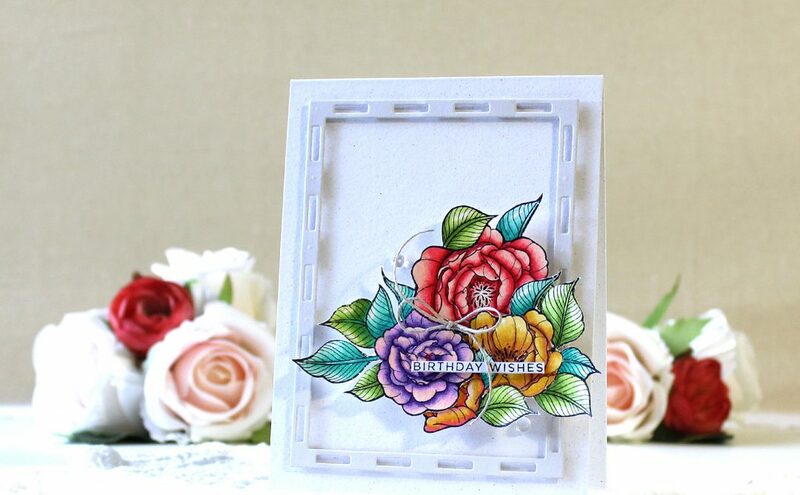 Gorgeous palette on this pretty card. Thanks for sharing your creativity. I love the die Lots of Dots, and I love the card you made with the bright colors!